Whey powder is a manufactured nutritional supplement and food additive that comes from milk and is used for human and animal consumption. It is a by-product of the manufacture of cheese or casein. Whey powder is high in protein and lactose. Its appearance is creamy white and it has a bland flavor. During the manufacture of cheese, the solids in milk are coagulated to produce a curd, which will eventually become cheese. A watery by-product of this process, called whey, is rich in nutrients, containing lactose, protein, minerals and vitamins. Whey powder is made by reducing the water content through reverse osmosis and vacuum evaporation. It is then spray dried. This produces crystallized whey, which can be crushed into a powdered form. Commercially available whey powder usually has 60 to 75 percent lactose, a protein level of 11 to 18 percent, fat content of 1 to 1.5 percent and ash of 3.5 to 5 percent. The water content of whey powder is typically below 5 percent. Whey powder comes in a variety of forms. Sweet whey powder is the most common type, making up approximately 70 percent of the whey powder manufactured. It comes from fresh whey, derived from the production of cheeses, such as cheddar and Swiss, that are coagulated using rennet-type enzyme preparations. Sweet whey powder contains all of the protein, lactose, vitamins and minerals from the whey. Sour or acid whey powder comes from whey that is a result of using bacterial fermentation to coagulate milk for cheeses such as cottage cheese and ricotta. Acid whey powder, while more acidic than sweet whey powder, has the same nutritional value. Demineralized whey powder has had the majority of minerals removed. Delactosed whey powder is produced by crystallizing the lactose in the whey and removing it. Whey powder is used as a food additive in baked goods, processed cheese products, sauces, dressings, prepared meat products, beverages and confections. It can work as an extender and binder in food products. 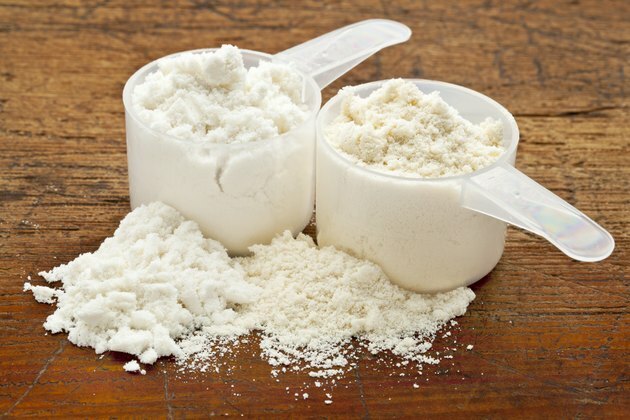 Demineralized whey protein is used in the manufacture of diet foods, baby foods, dry prepared mixes and other food products that need specific mineral requirements. Whey powder is also used as a dietary and nutritional supplement to improve protein intake. It is available in pure powdered form, as well as dry drink mixes and prepared beverages. Whey powder is also used in the manufacture of animal feed and pet foods.